Victorian style widespread faucet is constructed of a solid brass body for enhanced finish and performance. Simple installation for an easy upgrade. 2-handle design and quarter turn handle stops for ease of use. Make your bathroom look like new with this chic, useful piece from Delta. This dual-control faucet gives off a modern feel and looks great in any bathroom. This item's easy-to-install deck mounted design gives a fresh look to any counter top. This faucet is WaterSense certified so it uses less water and energy. Make your bathroom look even nicer with this item from Delta. Make your bathroom look even fresher with this dual-control faucet. Its deck mounted design fits with many sinks and isn't hard to install. This WaterSense certified faucet uses less water but gives you the same clean every time. Show off your style with this beautiful piece from Delta. Redo the look of your bathroom with this beautiful dual-control faucet. This item's deck mounted design is easy to set up so you can enjoy a finished counter top. This WaterSense certified faucet saves water and money, but gives you the same clean. 8 inch Widespread 2-Handle High-Arc Bathroom Faucet in Oil Rubbed Bronze Victorian style widespread faucet is constructed of a solid brass body for enhanced finish and performance. Simple installation for an easy upgrade. 2-handle design and quarter turn handle stops for ease of use. 8 inch Widespread 2-Handle High-Arc Bathroom Faucet in Oil Rubbed Bronze is rated 3.3 out of 5 by 12. Rated 5 out of 5 by Woodworker from Easy installation. Works fine. Easy installation. Works fine. Rated 2 out of 5 by Michael from appearance goodfunction fair to poor, reason: plastic drain lever was... appearance goodfunction fair to poor, reason: plastic drain lever was too short. Rated 1 out of 5 by disappointed from 3 out of 5 were broken I wanted to love these both for their style and price. Really I did. I ordered 5 of these for a whole house reno. 3 of the 5 were malfunctioning on the left handle. It leaked and could not be easily remedied. I've had to order 2 more in hopes that at least one will function to complete the project. And that isn't even mentioning that the drain stopper is awkward and thin, it bends very easily and looks weird. Rated 3 out of 5 by CRTMAM from Defective product, but HomeDepot working to make good on it I bought two of these faucet sets for a bathroom remodel. Both are beautiful and the contractor said they were about average to install. However, one of the sets leaks........even when it's not turned on. Home Depot was extremely helpful.......they will allow a return for full credit of the defective one and even gave a 5% discount on the replacement set. However, with a 50% failure rate AND having to pay the contractor for additional installation costs, I'm not pleased with the product. Rated 1 out of 5 by amy777 from Very poor quality I bought this because it I liked the design, and regret my decision. The product is such poor quality the finish was peeling off the first day installed. The hardware included to to install was so cheap, the plug was "spongey". I had to pay a plumber to remove it it and install the one I should have bought the first time round. 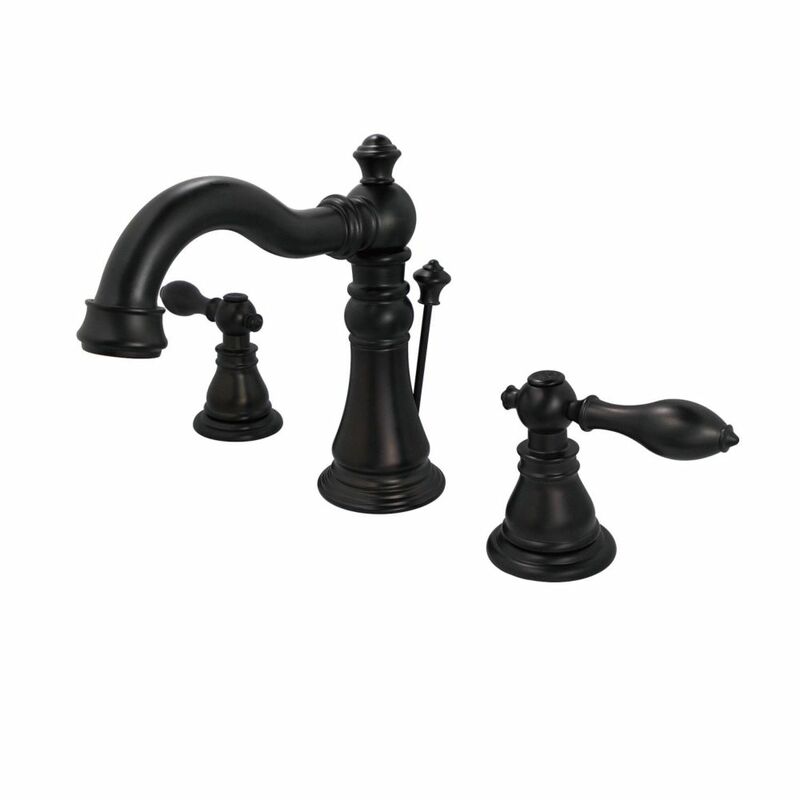 Rated 5 out of 5 by Searcher from A quality faucet but it is black A well made quality faucet. However it is much closer to black in color than "oil rubbed bronze. Rated 1 out of 5 by Ghia from Not very good quality Ordered 2 of these. If we liked, we wanted 2 more. Several comments we saw said the lift rod for drain "scratched" easy. We figured people were just too rough. Only opened one box; found that lift rod comes "pre-scratched" right out of the box; both on the top and down on the rod. Have to assume that the rest of the finish is also worthless. We are back to looking at other brands. Rated 4 out of 5 by DIYHome from Looks great Faucet was easy to install and looks nice in our guest bathroom. Great water flow.